Mystery Surrounds Hunan Girl&apos;s Death; Are Chinese Authorities Covering Up Again? Following the announcement by Hunan Province health officials that He Yin had tested negative for bird flu, He Yin&apos;s father, He Tieguang, testified in Hong Kong&apos;s Ming Pao Daily News that his daughter was cremated the same day health officials took her body. When asked if an autopsy was conducted at the hospital before the cremation, He Tieguang said, "I don&apos;t think so." He Tieguang stated that he was not aware of the health officials&apos; announcement and that they had not contacted him or his family to obtain samples for further testing. Since He Yin&apos;s death on October 17, her brother, He Junyao, is still being quarantined at a children&apos;s hospital for further observation. He Tieguang questioned why health officials have not released his son when they have clearly ruled out bird flu. The He family lives in Hunan&apos;s Xiangtan County. Just one week ago, He Yin and her brother became ill after eating infected poultry. 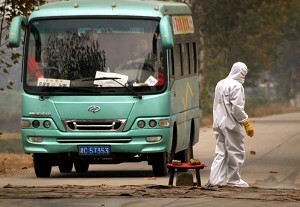 The Chinese Authorities announced that the girl died of "pneumonia" and not bird flu. Currently, He&apos;s entire village is quarantined. A representative from the World Health Organization (WHO) said it had contacted the Health Ministry for more information about the tests that were conducted on the Hunan girl. The WHO representative stated further that it did not know what tests Chinese officials had performed. WHO officials have warned that the H5N1 strain of the bird flu is even deadlier than SARS. The death rate is 15 percent for SARS and 33 percent for H5N1. Experts have stated that many farmers in China and Asia live close to domestic bird farms which increases the chance of human infections. This also increases the chances of the strain mutating into a more virulent form among humans, one capable of causing a human pandemic. At the International Bird Flu Prevention Meeting in Canada on October 25, Chinese Health Minister Gao Qiang revealed that there are currently bird flu outbreaks in five Chinese provinces, including Qinghai, Anhui, Hunan, Xinjiang, and Inner Mongolia. However, the Chinese state-run media outlets have only reported outbreaks in Anhui, Hunan, and Inner Mongolia. During the press conference, Gao also revealed that last year, 16 provinces exprerienced bird flu outbreaks. According to Radio Free Asia (RFA), the State Council Information Office held a press conference with the Ministries of Health and Agriculture on October 28. Jia Youling, Chief veterinary officer of China&apos;s Ministry of Agriculture, stated that, "The three outbreaks are currently under control and no new outbreaks have been reported." During the press conference, overseas reporters had to probe around the same questions. A reporter from Sankei Shimbun frankly asked the Chinese official to respond with conscience regarding the May incident in which 120 people in Qinghai became infected with the bird flu and died. The reporter explained that such a request was made because the world still has fresh memories of the Chinese government concealing information about SARS in 2003. In response to this particular question, Jia denied that the deaths in Qinghai were connected with bird flu. On a well-known online Hunan Forum, all threads related to the bird flu are strictly controlled by the Chinese authorities, and some posts have already been removed. Internet users can only indirectly vent out their anger at the situation. International communities have criticized the Chinese government&apos;s handling of the bird flu outbreaks, saying that it has not learned its lesson from the SARS outbreak.